EFFECTIVELY CONVEYS THE EMOTIONAL AND PHYSICAL IMPACT OF PET ASSISTED THERAPY! 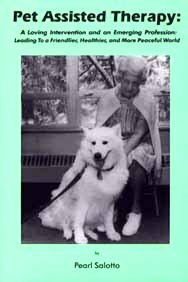 Pet Assisted Therapy (PAT) features both basic information on PAT and detailed explanations of its effectiveness with children, individuals who are elderly, and those dealing with physical and mental challenges. This invaluable resource provides the reader with a thorough overview of PAT including instruction, guidelines, ethical standards, descriptions of field experiences and discussions of the issues critical to the development and advancement of PAT in the health care, education, social service, and criminal justice arenas. In addition, this book can serve as a guide for people to work within their own communities to advance legislation and public policy on behalf of people and animals. Contributed articles by current practitioners of PAT who offer their perspective on the many different aspects of practice. This illustrated text portrays the positive, therapeutic, and mutually beneficial connection between people and animals. Presented in a style that conveys the emotional and physical impact of PAT for college students in health care, education, social service, and criminal justice, as well as professionals in those fields. -- Dr. Jon A. Mukand, Medical Director for the Southern New England Rehabilitation Center, Providence, R.I.
-- David C. Woolman, Ph.D, Ciricumlum Specialist, Adams Library, Rhode Island College, Providence, R.I.
-- Peter B. Belinsky, V.M.D, RI Public Health Veterinarian, RI Department of Environmental Management, Providence, R.I.
Pearl Salotto is a Curriculum Specialist in PAT at all educational levels and is a nationally recognized speaker, writer, and video producer on PAT. She has been an outspoken advocate for the professionalization of PAT for the past fifteen years.